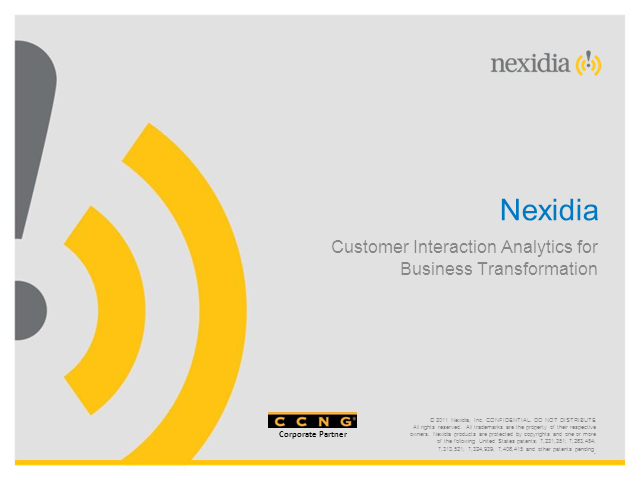 Join CCNG's David Hadobas and Jeff Schlueter of Nexidia for a discussion on Customer Interaction Analytics for Business Transformation. Hear how Nexidia’s customer interaction analytics solutions enable companies to drive business transformation by capturing, making sense of, and using the full range of communications they have with customers, including voice, email and social media. Nexidia expertise helps companies employ this data both for operational improvements and as a catalyst for strategic business transformation.